HB10: Speelkaartenfabriek “Nederland”, Amsterdam. Club Piket. Ca.1930. Price: € 50.00. Unused deck in slightly worn box. 42 cards, complete, BUT in Hearts it is 6 to 9, instead of 7 to 10. There is an extra card Heart 9 ! HB11: De Gentenaar. Price: € 3.00. 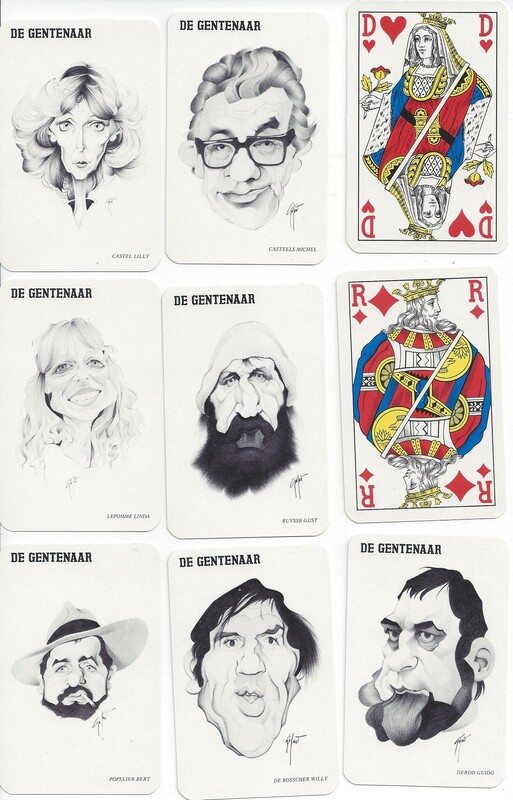 The newspaper De Gentenaar, from Gent, has published this deck, with caricatures of local personages. Unused deck in slightly worn box. HB12: Gemeente UDEN. Price: € 3.00. Pictures from the township of Uden. Unused in box. HB13: Focus. Photo Playing Cards. Edland Man. 1994. Price: € 30.00. Unused deck in box. 52 + joker + text card. Big size: 21 x 14,9 cm. Photos on all cards. HB14: Price: € 4.00. 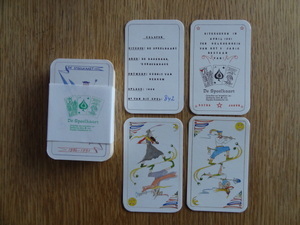 A selection of court cards. 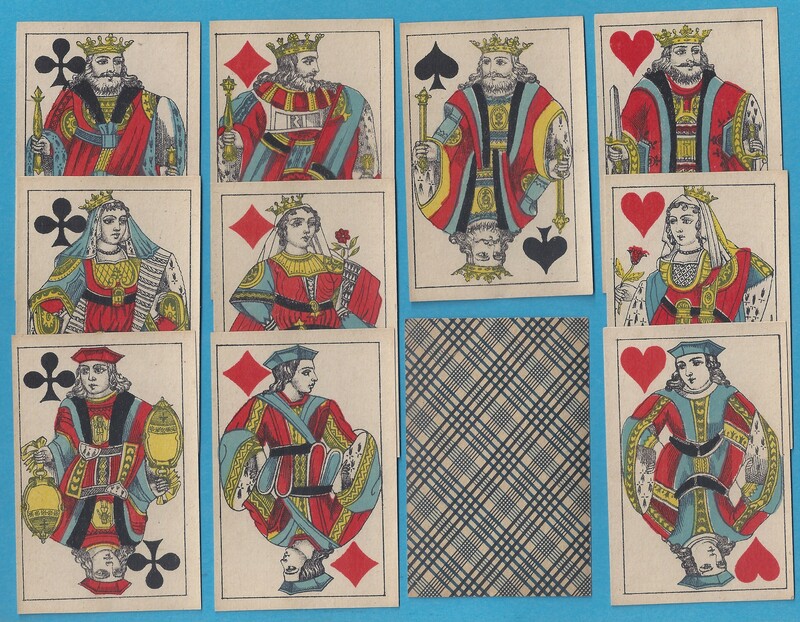 Eight singles, where front and back is shown, – then a 9th with blue back (bottom left) with 15 singles, and finally 16 singles with red flowery back. Unused and used cards. HB15: Paul C. Kaiser. Ca.1930. Price: € 20.00. Advertisement for a Bisquit production in Rotterdam. 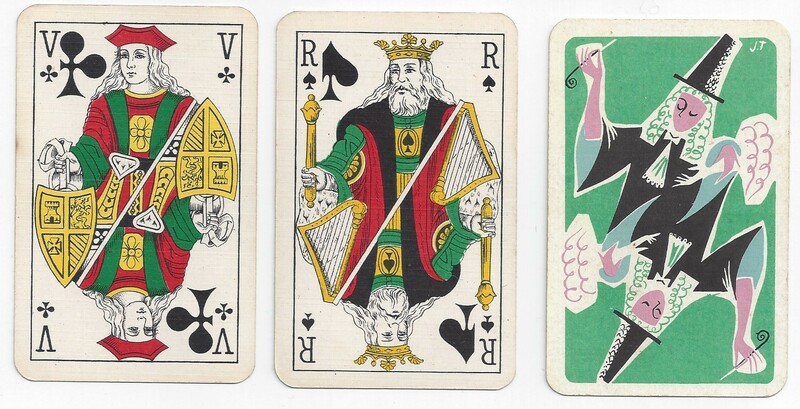 Beautiful and period-typical advertisement cards, meant for the game of Quartet. 10×4 cards. Nice condition, seem unused. The box is defect with a missing lid. HB16: Carta Mundi. La Grande Arche. Price: € 2.00. Advertisement for the Spreckelsen Tower in Paris. Unused, two jokers and a text card. No box. HB17: Oberon Strips. Ca.1985. Price: € 4.00. On all court cards and aces there is a cartoon figure. Unused cards. No box. HB18: De Speelkart. 1991. Price: € 7.00. Published on the occasion of 5-year-jubilee of the Dutch (Belgian?) Journal for Card collectors. HB19: Lombard-Casterman. Tintin. Ca.1985. Price: € 7.00. Unused cards in box. 52 + 2 jokers + text-card. Figures on all cards. HB20: Green Heart. Music Marketing & Sales., Holland. Price: € 6.00. A relatively rare, and funny advertising deck. HB21: Carta Mundi. Jeebee. Dessiné par Renaud. SM. Price: € 9.00. Unused deck, 52 + 3 cards, in slightly worn box. Rather “advanced” Sado-Maso drawings. HB22: Turnhout. Price: € 25.00. 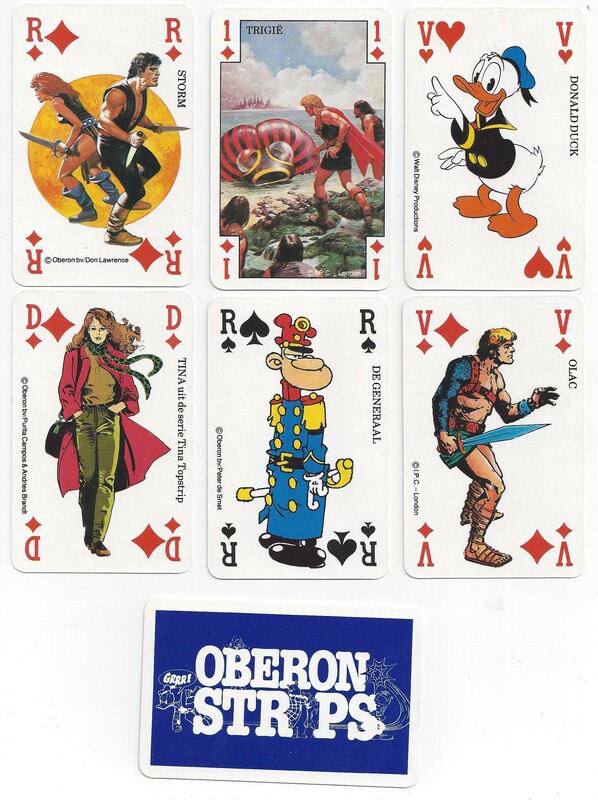 A selection of singles, seemingly used as reference cards in the production. Two wrappers. All unused. HB23: Mesmaeker, Turnhout. Exposition 1910. Whist No.11. 1910. Price: € 15.00. 52 cards in box, all used but not worn. Danish custom mark “G” = 1910. 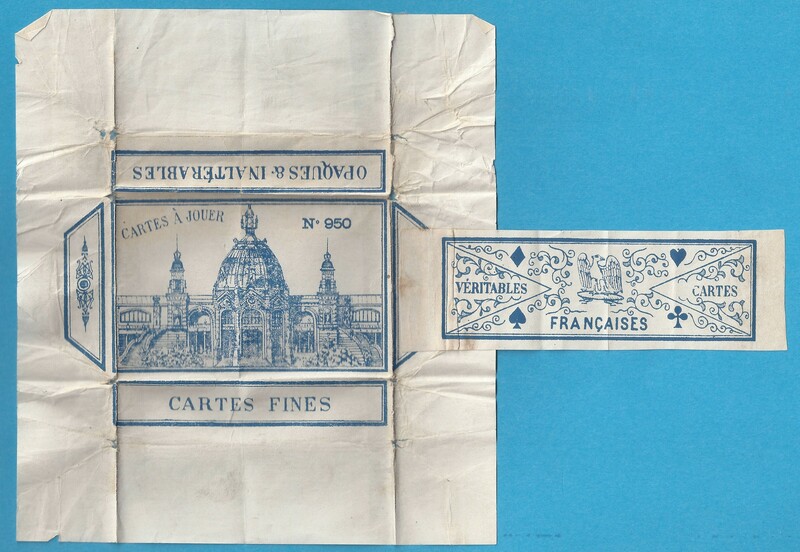 But also a green tax stamp on the Ace of Diamonds, signalling after 1918! HB24: Skalk. Musikalische Spielkarten. Repr. 2010. Price: € 7.00. 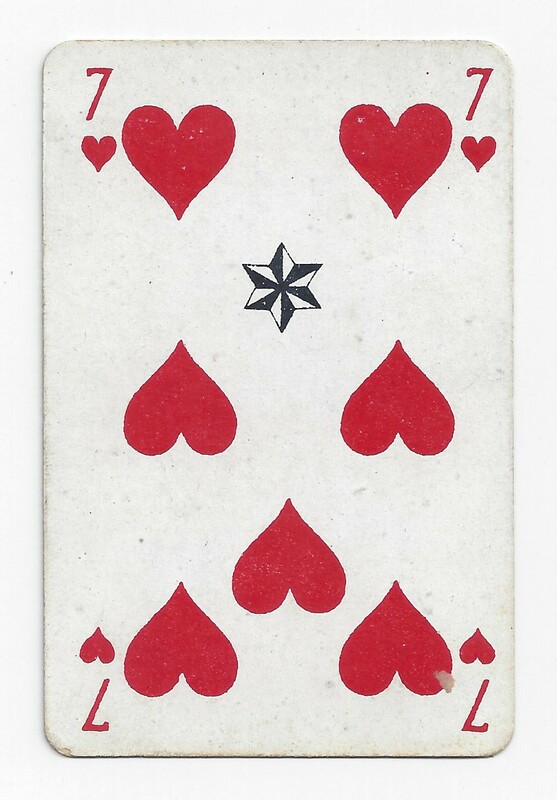 Reprint of a deck printed in Brussel between 1770 and 1786. Used in a Danish Manorhouse at the time. 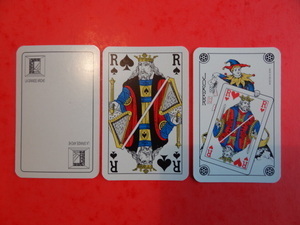 3 text-cards. Unused, in box. HB25a: Cartes Fines. No.18. Pris: Kr.20.00. Blå bagside. Et ældre ubrugt spil i let defekt æske. HB25b: Kr.10.00. Samme spil, rød bagside, slidte, i æske uden låg. En lidt interessant joker. HB26: S.N. 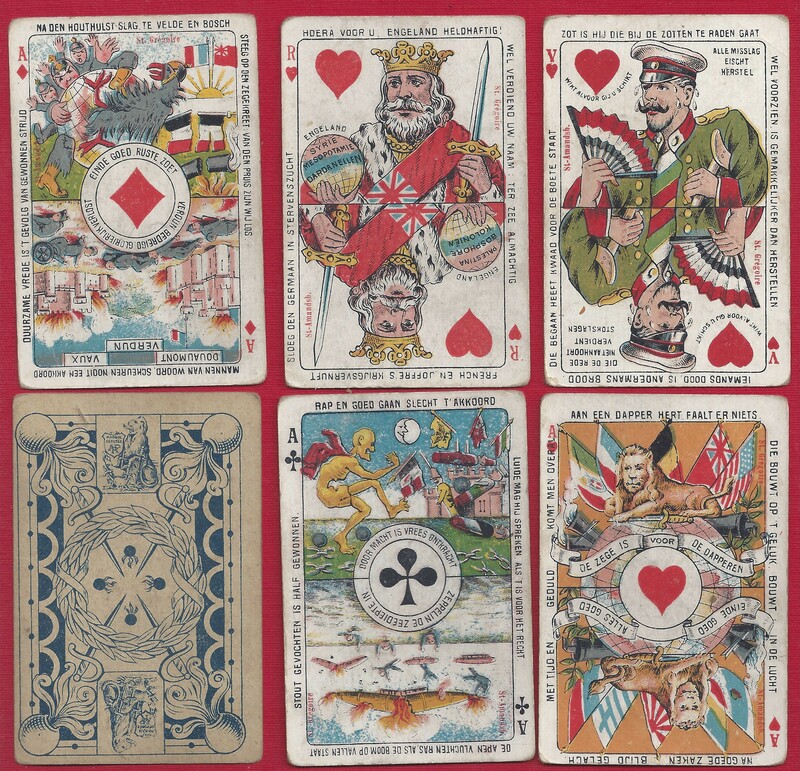 Playing Cards Manufactures. No.77. Price: € 6.00. Two older decks, probably from the 1930s, with the name Fortune. Both decks ar used/worn. Both with 52 cards + 1 joker + 1 blank. Both boxes are worn and with a broken opening. HB28: Mesmaeker. No.46. Ca.1930. Price: € 8.00. Patience deck. Lightly used, in box. 1 joker. 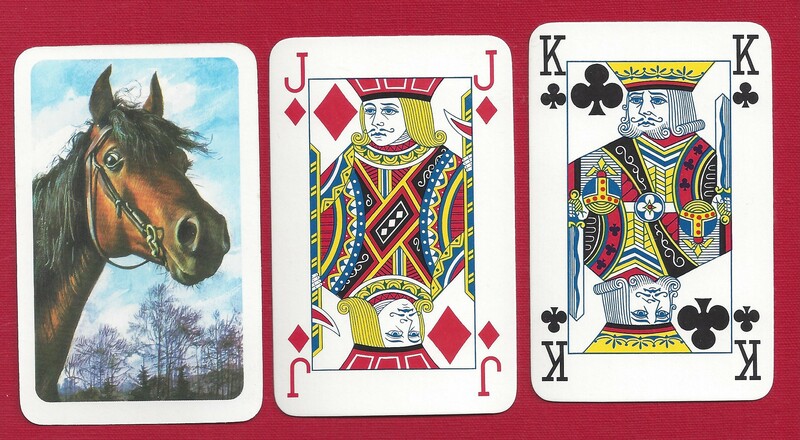 HB29: Horse. Carta Mundi. Price: € 1.00. 52 + 3 unused cards, no box. HB30: Scaldia Papier. Design: Gerard Wibin. Ca.2016. Price: € 15.00. 52 cards, unused, in box. HB31: The Devils picturebook. Anir Witt. 1997. Price: € 40.00. First edition. 1000 copies. Unused in box. Leaflet. Four artists have decorated one suit each. Pictures on all cards. HB32: Belgien. Sobranie. 1983. Price: € 80.00. Art decó. Design by Erté. Advertisement for cigarettes. 52 + 2 cards, unused, with golden edges. No box. HB33: Holland. Management. Price: € 3.00. Unused deck in box. Shows graphically how management consultants work with us!!! Oh, God – haven’t we just been subjected to that again and again! . HB35: Belgien. Carta Mundi. Turnhout. Price: € 2.00. A deck printed for a local festival. 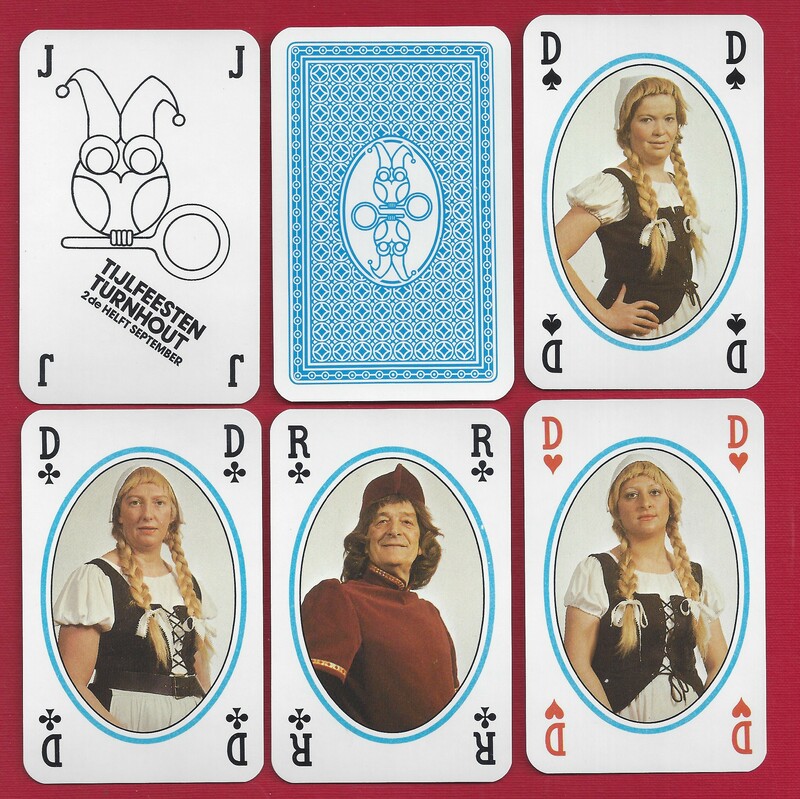 Different people in different costumes on all court cards. Unused deck, two jokers, in box. HB36 : Belgien. Turnhout. Cartes Imperials. Ca.1930. Price: 20.00. 32 cards complete. Used/smudged. No box. HB37: Joost Swarte. Krolse Katten Kaarten. 1995. Price: € 20.00. Unused deck, 52 + 2, in worn box. HB39a: Charles Pry (1915-87). Synthese. 1969/74. Price: € 150.00. 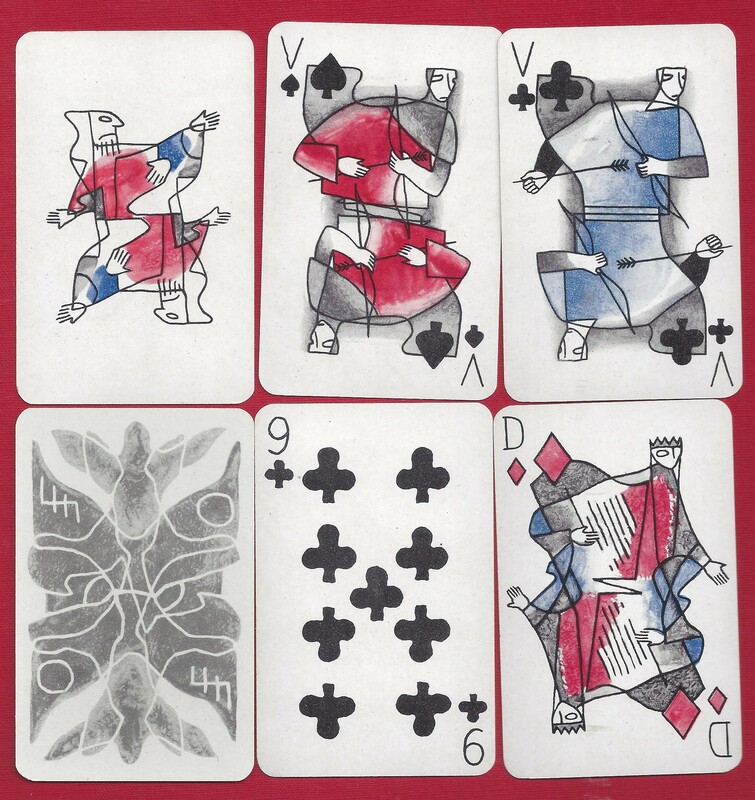 Belgian avantgarde-artist, who has made several decks of cards. Unused cards, 32 + 3 + text card. No.11 of 100. Laminated, hand-coloured cards. No box (there never was). HB39b: Charles Pry (1915-87). L’Art est Magique. 1969/74. Price: € 100.00. 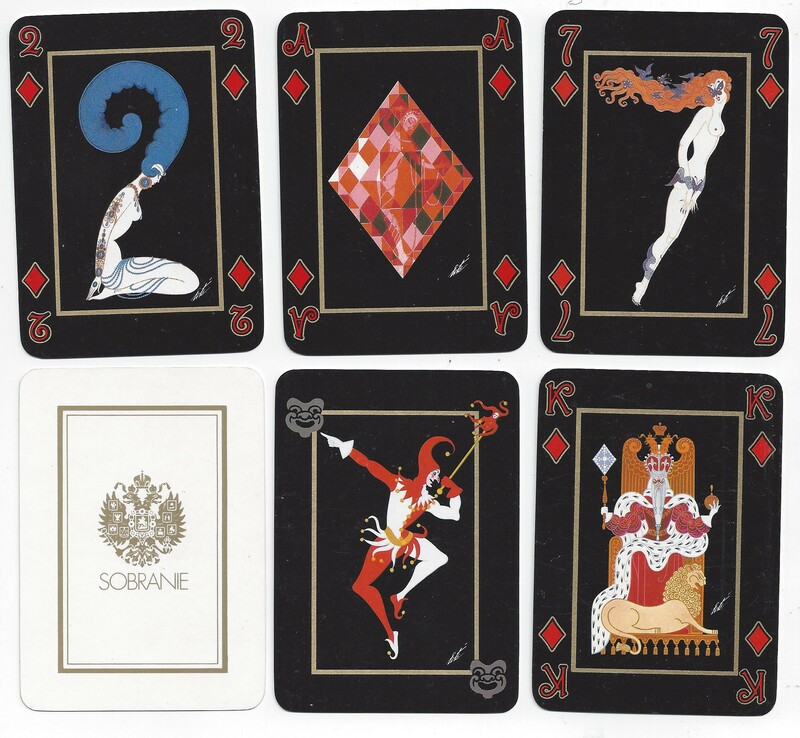 Belgian avantgarde-artist, who has made several decks of cards. 40 Unused cards, complete. No.39 of 100. Offset. Mounted on cardboard, that have loosened on several cards. No box (there never was). HB40: Turnhout. L. Biermans. Jeu desd Alliés. 1919. Price: € 100.00. This is the Dutch version. Worn. Here I have 30 cards = The 16 court cards, plus 7-10 (7 and 9 of Spades are missing). The deck came with 52 cards. No box. HB41: Mesmaekers Frères. Victoire. 1945. Price: € 100.00. Unused deck with golden corners, the front is yellowed in different degrees, the back is mint! Worn box with defect lid. 52 + 1 joker, complete. 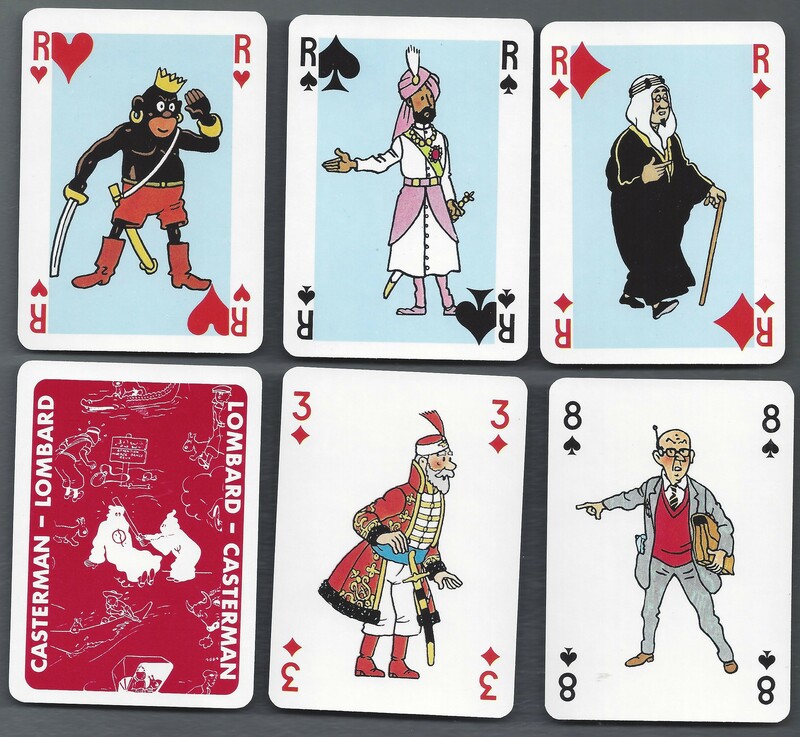 HB42: Jeu de 54 Cartes. Price: € 1.00. Used cards. 1 joker. 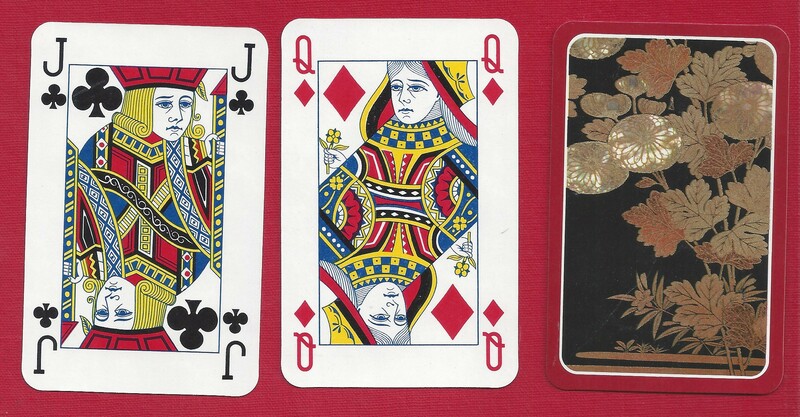 10 of diamonds and 5 and 7 of spades are missing. Worn box. HB44: Belgium. Renée Sturbelle. 1947/1960. 5,7 x 8,9 cm. Price: € 70.00. Slightly played deck. Cubistic art. 1 joker, no box. There has been uncertainty regarding a possible reprint in 1960, but I have found no certain text on that matter. HB45: Carta Mundi. Japan. Price: € 2.00. Slightly used deck. 52 + 2 + 1 cards. No box.